The very beginning of June had us with the camper trailer in tow heading back down that bumpy road to Daly River for the 'Merrepen' Festival. There is a circuit of festivals that run through the dry and this is one of them. They are spread from one side of the NT to the other and so far we have been able to see two of the half dozen more famous ones. 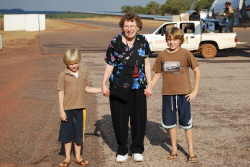 The first one that we saw was in Jabiru on our last trip in 2006. So we headed off at lunch time on Friday and our destination was the 'Mango Farm' which is located on the Wadeye side of the Daly River. As well as a mango farm it is also a large tourist park with powered and unpowered sites and cabins. 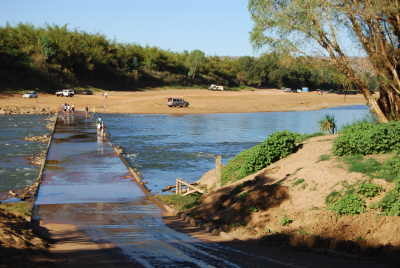 It is right on the Daly and has it's own boat ramp so is very popular with the fishermen. The Daly is renowned as one of the best areas in the NT for Barra fishing. Unfortunately this time we did not have time to throw in a line but it is on our list of things to do. The mighty Daly River that had us held prisoner for so long earlier this year is now just a trickle of it's former self. It's hard to imagine that crossing with 18 metres of water over it now. It was nice to get the Camper out again, with this being the first time we have used it since arriving here in early February. Other than the fact that we had completely forgotten how to put it up, and that I bent the jockey wheel so badly that it wouldn't go up or down and needs replacing, the set up went well. Oh I think there was one other minor disaster but it just slips my mind at present. Once again we were very happy with the camper as not one bit of dust made its way inside during the 190km of dust, dust and more dust, despite the outside of it looking like a mound of dirt. Let me tell you after a long, bumpy, difficult and tiring drive, the last thing you want to do is then have to clean dust out of your mobile home. So the Traditional Camper has passed yet another test. 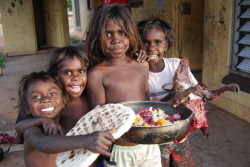 Saturday we drove the few kms into the community of Daly River or 'Nauiyu'. What a beautiful place and how different two communities, that are so close together can be. All the houses were well maintained, clothes hanging on the clotheslines(!!! ), no rubbish, no graffiti and incredible facilities. Now I have no doubt the place was cleaned up to some extent for the festival, but it was very obvious that this is basically what it is like all the time. For a small community it had the best sporting facilities we have seen. A green lush football oval, dedicated soft ball pitch and a huge indoor basketball stadium, all of which were 100% maintained. The community has a well equipped shop, service station, a Catholic School & Church and a very, very flash Arts Centre. Talk about chalk and cheese. 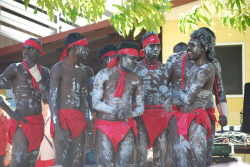 The festival was mostly about art with hundreds of paintings for sale, some traditional dancing and sport. The majority of the art was of a very high standard with some paintings going for up to $3,000-00 and a few even over that. There were also plenty in the up to $500-00 bracket. We did not see one single painting that we liked as much as our Timothy Dumoo but in saying that we certainly did not walk away without buying anything. In fact we ended up with 3 masterpieces that look very striking on our wall. The first was painted by a 5 yr old, the second by an 8 yr old and the last one by a 10 yr old. They are all on mounted canvases and cost $15-00 each from the local school, which was selling the art as a fund raiser. These young people have a real future ahead of them if they pursue their talent. There was also a lot of sport that ran continuously all day. The football was the focus of the day with some great games played. Unfortunately the Wadeye team was knocked out in the semi by supposedly some dodgy scoring. Well that's their story!!! The month also started out on a sad note with the death of the Traditional owner of Fossil Heads. His death seemed to create a chain reaction and there have now been 6 deaths this month, a number of whom are traditional owners of different areas around Wadeye. It has been a very sad time for the community and there has been quite a morbid air about the place. After the death of a traditional owner or a respected elder, their homelands are closed to everybody. The length of closure can range from weeks to years, so we are really glad we have got to see so many of the local places as now everywhere around us is closed. While we expect most to open soon, we expect Fossil Heads to be closed for a very long time. With deaths come funerals and I was lucky enough to be invited to one recently. The gentleman was someone I had got to know very well who passed away late last month. A true gentleman and respected elder to the end. It is common for the time between death and the funeral to be weeks at best to more than a month. I am not sure why the time frame is so long, with the most likely reason being the time it takes to arrange for family and friends to fly in for the funeral. The funeral was an incredible experience with an outpouring of grief like I have never seen nor could ever imagine. 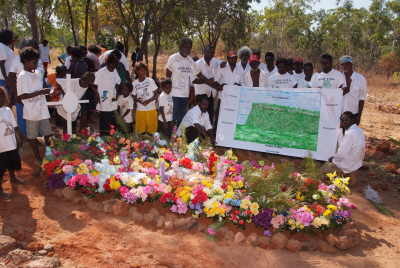 The funeral was attended by most of the community and went for 2 1/2 hours. The whaling, crying and screaming was mildly distressing as a visitor, but at the same time moving. I was particularly moved when asked by one of the family members if I would be the person from the clinic to place some flowers onto his coffin. I felt very proud at that moment and felt an acceptance by the community and particularly by his family. It was a very special moment that I will remember forever. Rest in Peace George. Our string of visitors continued. 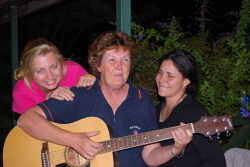 We had just got rid of my mum when Chris's sister Anne flew in for a week. Then she left and less than a week later Chris's mother, Jan flew in for 10 days. God I hope there are no more family members out there. Then we were about to get rid of the mother-in-law and Chris's sister Anne, came back again with her son Nic (our nephew) in tow for another 4 days in a 'Wicked' van. 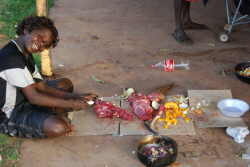 Now didn't that stand out in down town Wadeye. What have I done to deserve this??!!!! Obviously we will have to shift further into the middle of nowhere to deal with this issue. And I thought we were far enough away!! It was excellent having everyone to stay but must say after nearly 6 weeks of people staying most of that time, it was nice to have our little house to ourselves again. Everyone had an interesting holiday and one that I am sure they will remember for a long time to come. With diesel now $2-50 a litre out here now we had Anne bringing in 40 litres for us to get us back to civilisation where we will only have to pay $1-85. Who would ever have thought we would have seen prices like that! So June has come and gone in a flash. We have seen a few people from work leave, with a couple being reasonable long-termers (Lexi 6 months and Noella 9 months). I have never been to so many farewell do's since shifting out here. Rarely does a week go by when somebody, usually a short termer is not leaving. We recently had another bloke out for a month which was a nice change. Simon is from downtown Melbourne and really enjoyed his time out here. He spent a lot of time at our place which was great as he always bought over expensive beer and enough meat to feed half the town. In fact we are still eating the meat he left. He was good fun and we were sorry to see him leave. It was also a sad month for Alex and Harry as their mates Tom, Ned and Charlie have left town and moved back to Bright in Victoria after being out here for nearly four years in a couple of stints. They will be a big loss as they were either at our house or the boys were at theirs almost constantly. It was also a busy month for me at work as I was given the task of facilitating the 'Trachoma Treatment Program'. Trachoma is caused by a bacteria in the eye that if left untreated can amongst other things cause blindness. At school screening it was detected that we had a high percentage of kids with this infection so we had to treat every child 0-14 and every adult living in a home with an infected person. In a community with over 2,500 people this was a huge task and one that I was glad to see finished. We had to drive around the town and visit every house, weigh the kids, dose them and mark their hands with 'white out' so they would.not line up again for some more, plus dose the adults. While we had nowhere near a 100% treated we were very happy with what we achieved. That little gem can certainly be someone else's next year. We went out in the boat again (with Grandma this time) and even threw in a line. Alex caught a catfish which we threw back in. That barramundi still remains elusive, but I am patient so it will happen, just give me time. I have been out for a few rides on the motor bike and explored a few more areas that are now accessible. There is certainly a lot of things that we will miss when we leave here and certainly having unlimited use of the bikes and boat is one of them. 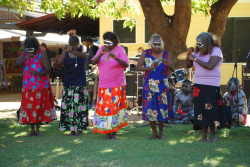 I had one of those great Wadeye moments a few weeks ago. I was driving through the back streets of town when Mikalas, a local lady I know well, called out to me and waved. I pulled over and walked the short distance to where she was sitting in her back yard. She was sitting on the ground surrounded by other members of her family. Lying on the ground next to her was a half cut up wallaby that they had just caught. It was being diced and thrown into a huge stew that was boiling away on the open fire. While the stew was cooking someone else was mixing and kneading some flour to make another damper, with one sitting in the ashes almost ready to be removed. I sat on the ground with them for ages chatting about their lives and some of the local traditions. It was a very special time and one that you only get when you live in a community for a length of time. The end of June sees us head off for 2 weeks holiday which was made up of 'Foil' (fly out of isolation leave - which we get 3 times a year), 'Toil' (time off in lieu) and a few days annual leave. 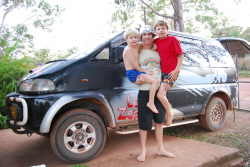 We will head off to Litchfield NP, Darwin and Kakadu and we are really looking forward to it. When we get back we will only have a month left before we pack up and leave Wadeye on August 10th, what has been home for 6 months. As I have said a number of times before, it will be a sad day leaving but with plenty more experiences ahead. A few weeks ago I thought I had best send out a few emails for a little work in Central Australia just before and after we head to Uluru to see the Priestleys. Within a few days I had offers of work for Ti Tree, Hermannsburg, Docker River and Utopia. We chose Docker River as it looked the most exciting. To get to Docker River you head out past Uluru and keep going until you get to the WA border. That really is Central Australia, in every sense of the word. This community in nestled in the Peterman Ranges and is reported to be very beautiful, be it a damn long way from anywhere. Should be exciting. There is absolutely no doubt that our 6 months here has been a great apprenticeship and with Wadeye on my resume it has made me look very attractive to perspective employers. The work is endless. The weather is still warm at home with no jumpers needed, although you can notice a slight chill in the morning air (down to about 22 C). I can assure you it doesn't last long with you being hot again by 0900. Every single day is just more blue skies. You could get sick of this weather, in about 100 years time. We all remain well with the boys plugging on through their home schooling. They enjoy having the run of the town and are constantly riding their bikes everywhere and finding new 'jumps'. Chris continues to really enjoy her 3 mornings a week at school and is known as the 'hearing teacher', as her main job is to work with kids with hearing loss and monitor their wearing of hearing aids. She will also be sad leaving her job as with anything like this there is always so much to do, and you are leaving lots of things unfinished. The Principal is already pleading with her to stay longer. Until next month- Stay well.